8.1918: Launched by Hawthorns & Co Ltd, Leith (Yd.No.160) (“Strath” class) for The Admiralty as WILLIAM HANBURY (Ad.No.3824). 3.10.1918: Completed as an armed trawler (1-12pdr). 19.07.1919: Arrived Milford Haven. Laid up. 3.1.1920 – 28.2.21: Landing at Milford. 27.3.1920: Registered by The Admiralty at London (Part I & IV) as William Hanbury O.N.144310 (LO344). 04.1920: At HM Dockyard, Pembroke fitted out for fishing under Special Survey of Lloyd’s Register and classed 100A1 Stm Trawler at Milford. Fishing out of Swansea. 16.4.1920: Surveyed at Swansea and re-measured 204g 82n. 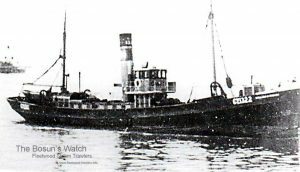 13.8.1920: Minesweepers’ Cooperative Trawling Society Ltd, London registered. 14.9.1920: In afternoon came upon a boat and picked up crew of the Plymouth owned Bridgwater ketch MERIDIAN (93grt/1858). The ketch on passage Par for Runcorn with china clay, had stranded in dense fog on the rocks near Smalls lighthouse at 9.00pm on 13.9.1920 and crew had abandoned in boat and stood off. 2.11.1921: Sold to Taylor Steam Fishing Co Ltd (64/64), Grimsby. 7.12.1921: Registered at Grimsby (GY1322). 7.12.1921: Henry Lewis Taylor designated manager. 25.11.1939: Paid off in Grimsby from her last trip. 26.11.1939: Requisitioned for war service and employed on auxiliary patrol duties (Nore/Sheerness)(Hire rate £61.4.0d/month). 13.2.1940: Sold to Boston Deep Sea Fishing & Ice Co Ltd (64/64), Fleetwood. 17.2.1940: Basil Arthur Parkes, Thornton-le-Fylde designated manager. 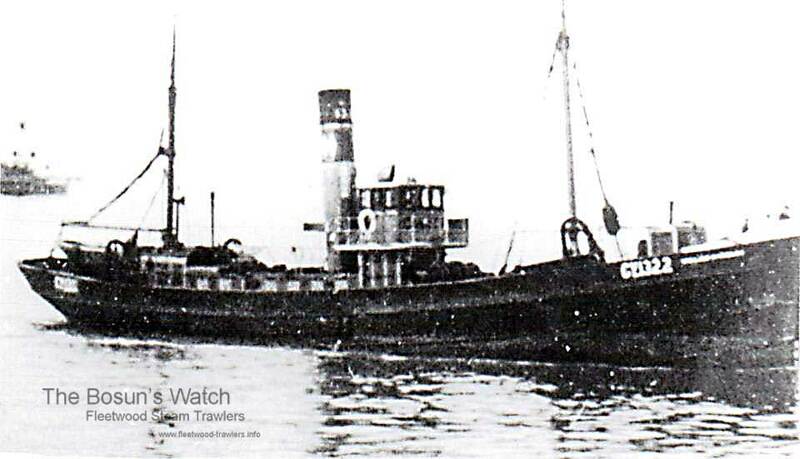 16.2.1940: Sailed Grimsby for fishing grounds and Fleetwood. 4.3.1940: Landed Fleetwood. Grimsby crew paid off*. 7.3.1940: First trip from Fleetwood. 20.1.1942: In a SW gale at approx 9.45 p.m. stranded on St. Anne’s Head, Isle of Man (Sk. Thomas J. Wade). Attended by Port St. Mary lifeboat SIR HEATH HARRISON. All crew+ taken off. Total Loss. 21.1.1942: At 3.00 a.m. Sk. Wade died of heart attack at Castletown. (Grimsby Crew* – Sk. H.G. Hunt; Mate, J. Gregory; Bosun, J. Hilton; Ch.Eng. L. Allott; 2nd Eng. J. Webster; A.E. Edgell, G. Briggs, firemen; J.W. Barton, deckhand/trimmer; W. Shepherd, G. Watcham, deckhands; R.W. Barton, cook. 08/01/2009: Page published. 4 updates since then. 21/03/2017: Information updated and FMHT logo removed from image. This entry was posted in Lost Vessels, Steam Trawlers and tagged Boston DSF & I, Lost, Parkes, Strath Class on January 8, 2009 by Fred Smith.